That's Life explored the challenges and joys of ageing. 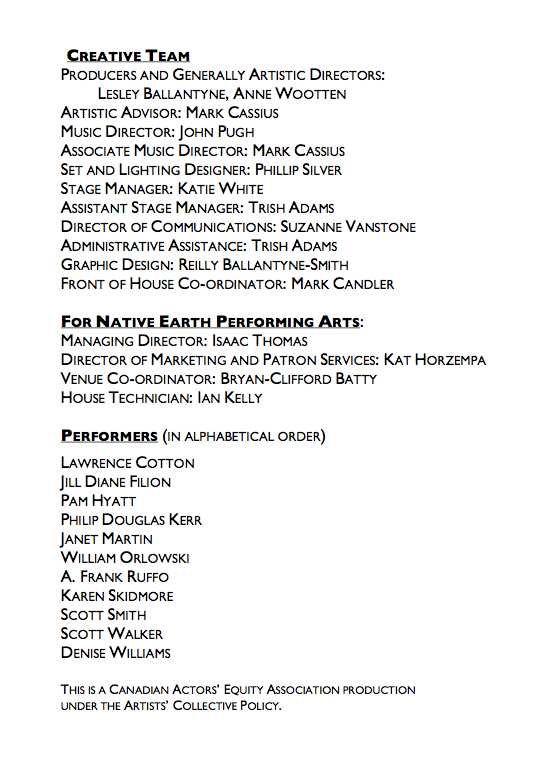 Mr. Cotton is thrilled to be a part of WSP with such a talented cast and creative team. 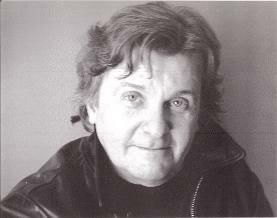 Equally at home in opera, musical theatre, theatre and on screen, credits include: The Hal Prince directed revival of Show Boat; The Phantom of the Opera; She Loves Me (Arts Club Vancouver); Giiwedin (Native Earth Performing Arts); 120 Songs For The Marquis De Sade (Modern Baroque Opera Vancouver, Jessie Award Best Supporting Actor); Orfeo (Montreal Baroque Festival, Stage Director, Laureate de Musique award Montreal Arts Council). Television credits include principal roles in Taken, Crash and Burn, The Pete Rose Story. He has co-written and produced two Opera for Young Audiences that have been seen at such venues as the Luminato Festival, Place Des Arts, the NAC and Palais Montcalm. A first CD of Jazz standards, Hoping You’ll Happen This Way, is available on iTunes through Pipistrelle in Canada and Naxos in the US. 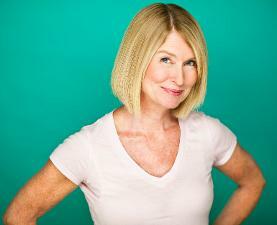 Jill Diane Filion grew up in Vancouver and appeared in her first musical, Oklahoma, at age 13, as a featured dancer. Favourite roles include Eliza in My Fair Lady, Marion in The Music Man, Signora Naccarelli in The Light in the Piazza and Elsa in The Sound of Music. Jill toured throughout BC for three seasons with the Vancouver Opera Ensemble, and was guest soloist with the Vancouver Chamber Ensemble, CBC Radio and the Kelowna Symphony. She was a member of both the touring and Toronto companies of The Phantom of the Opera and the original cast of Ragtime. She has since enjoyed three seasons with the Charlottetown Festival, seven with Drayton Entertainment and two with Theatre by the Bay. Jill is currently on the Voice Faculty at Sheridan College and still attends dance class. Pam Hyatt has entertained Canadians from coast to coast since 1958. 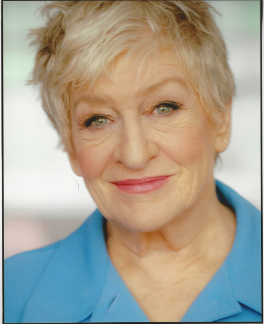 Trained classically at the Royal Academy of Dramatic Art in her youth, the London Academy of Music and Dramatic Art in her mid-century, Hyatt’s talents have graced stages at Stratford, the Royal Alex, cabarets, clubs, film and television. 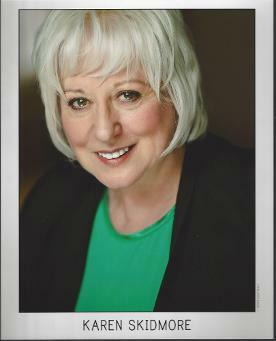 Favourite roles: Myra in Robin Phillips’ acclaimed Stratford production of Hay Fever avec Dame Maggie; Grandma Kurnitz, Lost In Yonkers / Chemainus Theatre Festival; Marilla, Anne of Green Gables / Sudbury; Selma Chargesse, The Red Eye of Love / Toronto. In film: Linda, Restoration, Director Zack Ward. TV: Estelle, A Christmas Song; Lady Manley Prowe, Something’s Afoot. Animation: Kaede, InuYasha; lots of meanies in Barbie DVDs; Frieda, Silverwing. Pam’s current alter ego: On YouTube, Chartwell’s “Ask Edna,” a deliciously zany gal – Betty White spliced with Dear Abby! Hyatt’s CD, Pamalot! is a favourite of JAZZ-FM’s Jaymz Bee. Gracias, Carson and Zack, for prodding Pam out of complacency. After obtaining a degree in architecture and working in the construction industry for 10 years, an abrupt career change lead Philip to the original Canadian cast of Les Misérables, including hundreds of performances as the hero Jean Valjean in Toronto, on two Canadian tours and in London’s West End. Other roles in England include Gus in Cats and Marcel in Aspects of Love. Back in Canada, he has appeared as Ralph in H.M.S. Pinafore, Herr Zeller in The Sound of Music, Sterling in Jasper Station, Vinnie in The Odd Couple, Gilbert in Things We Do for Love, and Bruce in Mama’s Country Record Collection. 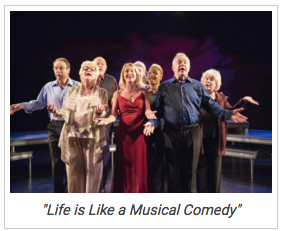 Most recently, Philip was thrilled to reunite with his dear friend Janet Martin, in A Broadway Valentine at Stratford’s Springworks Festival and at Mississauga Living Arts Centre. TV includes Flashpoint, The Music Man, Mayday, and the Tenth Anniversary Concert Production of Les Misérables, recorded live at London’s Royal Albert Hall. 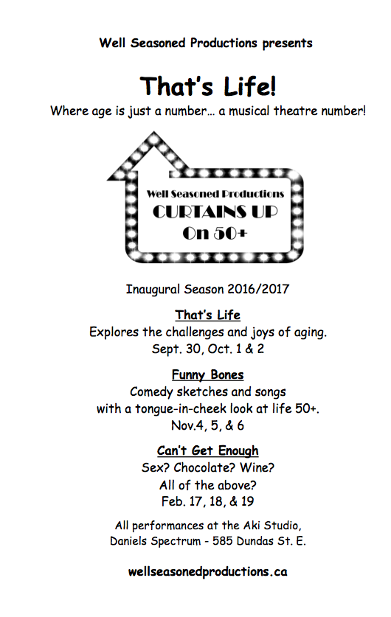 Janet is thrilled to be joining these wonderful friends and colleagues in That’s Life. Recently, Janet has become a partner and co-producer in Shaggypup Productions, producing Menopause The Musical and Menopause Out Loud in Canada. 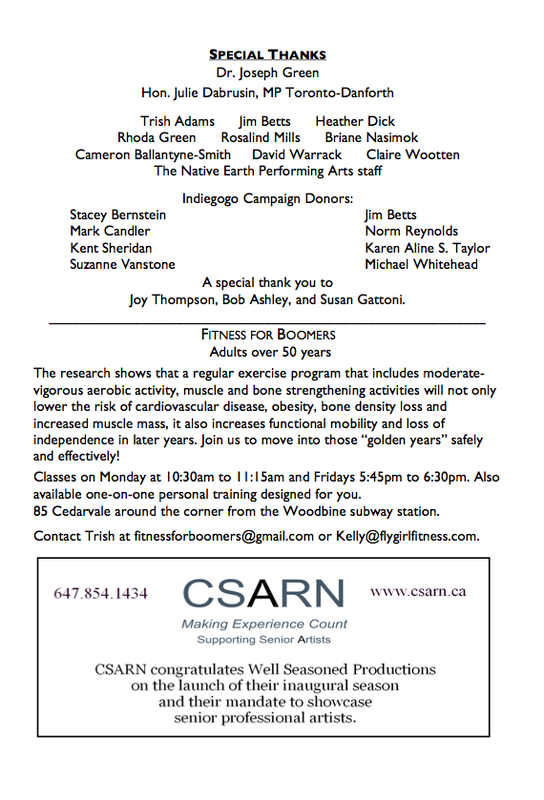 She is also an actor in the show, which opens November 11 at the Al Green Theatre, Spadina and Bloor. Past credits include Aldonza in Man of La Mancha, Mistress Page in Merry Wives of Windsor, Maria in Twelfth Night and Countess Rousillon in All’s Well That Ends Well. In Toronto, Janet appeared in The Sound of Music, Les Misérables and The Mikado playing across North America, including Broadway. She also spent seven years with the Toronto cast of The Phantom of the Opera. Janet is probably best known for her favourite role as Grizabella in Cats. She has co-written two shows – Three Little Maids and A Broadway Valentine which recently played at the Living Arts Centre in Mississauga. William Orlowski is one of Canada’s greatest tap dancers. He took dance lessons as a child after seeing the films of Fred Astaire. 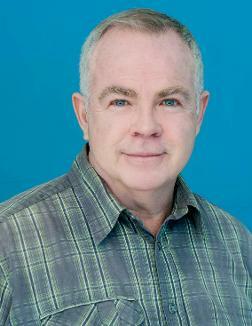 He appeared in community theatre productions and found work on television and in professional musical theatre. In 1977, he started a tap dance school, the Hoofer’s Club. Orlowski also co-founded a professional group, the National Tap Dance Company, and was its artistic director and resident choreographer for over 30 years. He created over 40 works for the company: among them The Tin Soldier, Oliver Button is a Sissy, The Hound of the Baskervilles and Brandenburg Concerto #3. In 1990, he started the William Orlowski Tap Dance Projects. Orlowski has choreographed numerous tap dance pieces for the concert stage and has collaborated with symphony orchestras and theatre companies, including the Shaw Festival. 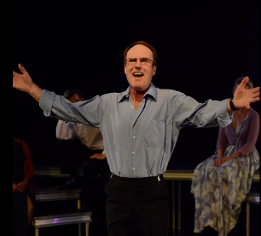 His choreography for Dames at Sea, directed by Brian Macdonald, won a Dora Mavor Moore Award for Best Choreography. A. Frank Ruffo is an acclaimed actor, singer, dancer who has performed in countless feature films and TV series, as well as in theatre and musical theatre. Film and television work includes principal roles in The Listener, Suits, Lost Girl, Murdoch Mysteries, Hairspray, Sixteen Blocks, Blue Murder, Queer as Folk, Hemingway vs. Callaghan, Dirty Work and Side Effects. Theatre credits include Over the River and Through the Woods (Theatre Aquarius, Grand Theatre, Sudbury Theatre Centre); Ed’s Garage (Theatre Collingwood); Annie Get Your Gun (Drayton Festival); Fiddler on the Roof (Stage West); A Funny Thing Happened on the Way to the Forum (Grand Theatre); On Albert Street, The Fantasticks (Theatre Aquarius); 42nd Street (Huron County Playhouse, Limelight Dinner Theatre); My Fair Lady (Edmonton Opera); The Wizard of Oz (Rainbow Stage); Gypsy, I Do,I Do, Vaudevillians (Huron County Playhouse); Guys and Dolls (Lighthouse Theatre); and, The Music Man (Sudbury Theatre Centre). 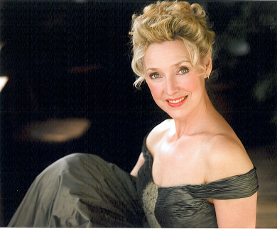 Karen Skidmore appeared at the Stratford Festival for seven seasons in the iconic Brian Macdonald musicals, including The Mikado and The Gondoliers. During her six seasons at the Shaw Festival, she was featured in many productions, notably On the Town and Lady, Be Good! While at Shaw, Karen created and performed two solo concert evenings under the guidance of Christopher Newton. Karen’s resume includes leading roles at The Grand Theatre (Misery), Theatre Aquarius, Theatre Orangeville, Drayton Entertainment, MTC, and ATP. TV and film credits include Murdoch Mysteries, the award-winning film Nureyev, and An Insignificant Harvey. Karen retired from the Ontario College of Teachers after teaching music and drama. She was an Associate Professor at the University of Windsor in the BFA program, and taught in the St. Clair College Musical Theatre diploma program. Karen is an experienced festival adjudicator, tutor, and coach. She lives in Acton with her husband Philip Drainie Taylor. 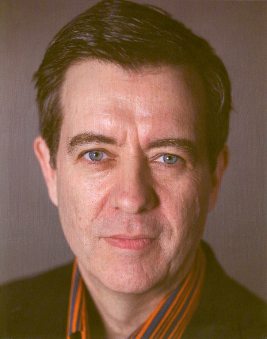 Scott Walker has appeared on stages across Canada in productions that range from Shakespeare to Steinbeck to Sondheim. Favourite roles include: Sky Masterson in Guys and Dolls, Professor Harold Hill in The Music Man, The King in The King & I, Harry in Company, and Slim in Of Mice and Men. 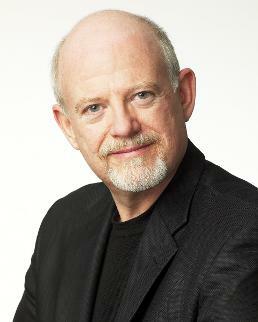 Scott has also appeared on television and film, most recently in the Hallmark movie Freshman Father. His critically-acclaimed solo CD contains a collection of classic pop standards, on which Scott is accompanied by a full 40-piece orchestra. His latest release is the love song Someone I Don’t Even Know. Scott is also the voice of the YouTube comedy hit Spiders on Drugs [37,000,000 hits so far]. 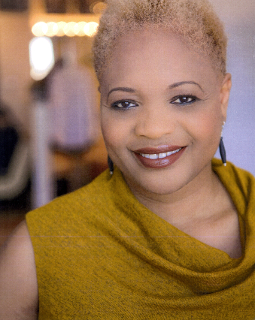 Denise Williams is a singer, voice teacher, artistic director, and producer, at home on the concert, opera, and theatre stages. Recent appearances in Toronto have been as Monisha in the Nathaniel Dett Chorale’s concert performance of Treemonisha at Koerner Hall, and a cast member of the Mirvish production of The Sound of Music at the Princess of Wales Theatre. Career highlights include: the title role of the Canadian stage play debut, Portia White: First You Dream, soloist with the Toronto Symphony Orchestra (TSO) in a concert of spirituals with the Nathaniel Dett Chorale and Kathleen Battle at Roy Thomson Hall, returning again with the TSO performing excerpts from Porgy and Bess with bass-baritone, Marcus Nance. Her passion for young adult performance education led her to launch No Strings Theatre which has nurtured a number of young theatre performers. Denise’s CD, Walk Together Children, is based on the roots of Black and Jewish cultural music. During his 50-year career, Phillip Silver designed for theatres across Canada, including Neptune Theatre, Theatre New Brunswick, National Arts Centre, Canadian Stage Company, Young People’s Theatre, Tarragon Theatre, Canadian Opera Company, Shaw Festival, The Grand Theatre, Edmonton Opera, Vancouver Opera, Manitoba Opera and Alberta Theatre Projects. As the resident designer at Edmonton’s Citadel Theatre from 1967 to 1978, he designed over 70 productions. Stratford Festival productions include Virginia with Maggie Smith, Pirates of Penzance, An Enemy of the People and The Merchant of Venice. Recently he designed set, costume and lighting for the Harold Green Jewish Theatre’s production of Rose. His designs have earned him three Dora awards. 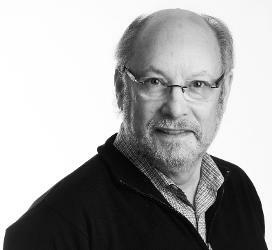 He has served as a consultant on the design of theatre facilities across Canada. He is a member of the Associated Designers of Canada and served as Dean of the York University Faculty of Fine Arts from 1998 to 2008. John is a music director, keyboardist, arranger/orchestrator from the Greater Toronto Area with over 17 years of experience in the performing arts. With a wide variety of knowledge in many different styles of music, John has had the opportunity to play with some of the best musicians the GTA has to offer. While the theatre is John’s first passion, he has also been very involved as a freelance pianist playing for cabarets, weddings, and private/corporate events. Some of his favourite MD/keyboard credits include: Jesus Christ Superstar, The Secret Garden, You’re A Good Man Charlie Brown, Les Misérables, The Rocky Horror Picture Show, and Rent. He would like to thank Anne, Lesley and the entire WSP team for this amazing opportunity to work and learn from so many talented people. Katie is thrilled to be joining the team of Well Seasoned Productions and to collaborate with this passionate team of artists. 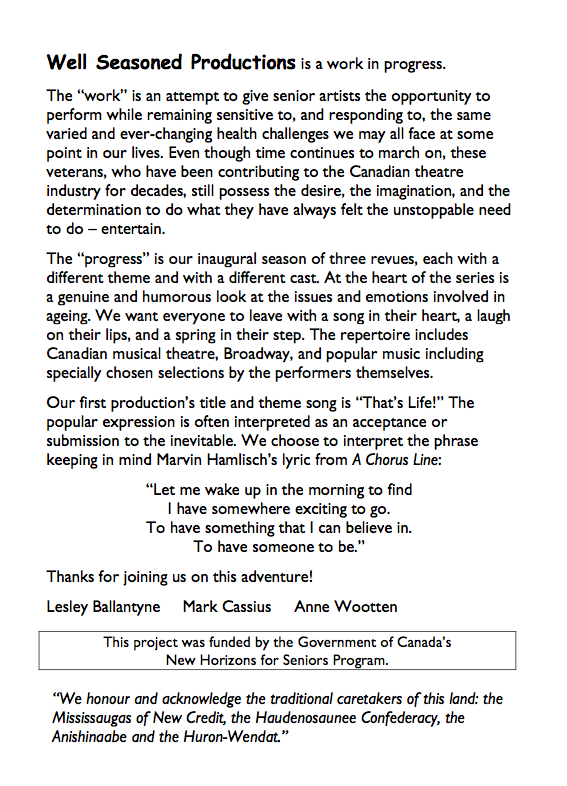 Previous credits include Canadian Opera Canada, Opera Atelier, Tapestry New Opera Works, Toronto Operetta Theatre, Canadian Children’s Opera Company, Opera on the Avalon, Thousand Islands Playhouse, Mirvish, Resurgence Theatre Company, Coal Mine Theatre, Native Earth Performing Arts, and St. Lawrence Shakespeare Company, as well as many smaller-scale new works. 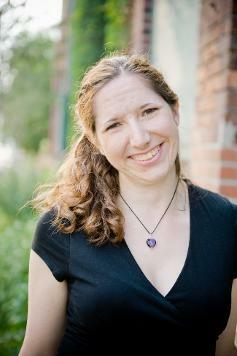 Katie is also one of the concert managers for Tafelmusik Baroque Ensemble. By far her proudest production to date is her spirited little boy, Tommy. and was presented under the Collective Agreement of Canadian Actors' Equity Association.